Sydney Central Inn offers a variety of SINGLES, DOUBLES, TRIPLES, DORMS & FAMILY ROOMS to suit your needs. Our century old building can accommodate up to 50 people in 15 different rooms. and security cameras are overlooking the corridors of each floors. Sydney Central Inn is equipped with all the basic facilities to make your stay a comfortable & enjoyable one : common kitchen, common lounge area with TV and more! Come alone, in pairs or with the whole bunch! We are a class above regular backpacker hostels providing clean, comfortable accommodation without the price of a hotel. Formerly known as the Chamberlain Hotel, our beautiful heritage building used to be home to actors and performers playing at the Capitol Theatre. We have the BEST location for any traveler! Everything you need is just seconds away! Surrounded by the coolest bars, clubs, restaurants and cafés in Sydney every night will be a new and an unforgettable experience. 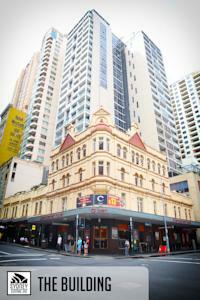 At the same time looking for clean quality budget accommodation, you will fell right home at Sydney Central Inn! We are friendly, eager to share and always up to help out! We just want you to have a great time in this city that we Love. We don't want you to spend your precious time in a boring laundromat around town. We've got you covered! Wifi is available for FREE! Well we are living in the 21st Century aren't we? Coming and going from Sydney to the airport without any hassle! We can organize a shuttle pickup. Ask us how! Rented a car or coming with your own? Underground parking is just around the corner. We have deals for you! Ground Level access to the Chamberlain Bar & Bistro. food and drinks all day! Need help to organize activities or the next step of your trip? We can organize book for you! We have an extensive choice! If you need more information ask away by using our contact form or by email or even call us!